A 15-minute climb uphill from the coastal Victory Village here will position one on top of the famous Kapuntukan Hill or the “Sleeping Lion,” which gives tourists the best and most marvelous view of Legazpi City -- with a magnificent view of the world’s unrivaled perfect cone, Mayon Volcano, in the background. It is the favorite site of photo enthusiasts, both professional and non-professional, who want to take shots of nature's moody beauty. It’s peak resembles a lion’s hunched back. 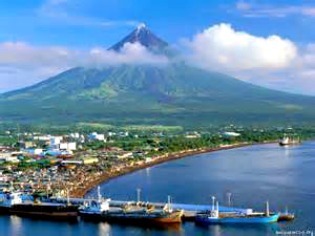 People who have gone up swear that it is the best place where one can have an excellent view of Mayon. The Kapuntukan Hill is one of the volcano's viewing areas recommended by Department of Tourism Bicol Regional Director Maria “Nini” Ong-Ravanilla. Others are the Mayon View Deck at the Lingnon Hill, Imperial Ridgeview in Barangay Buragwis, Legazpi City sea port fronting the volcano, Oriental Hotel, Taysan Hills in Barangay Estanza, Cagsawa Church and Cagsawa National Park in Daraga town. Other viewing sites are the national highway at the boundary of the towns of Camalig and Guinobatan, lower portion of Malabog in Daraga, Padang and Basud in Legazpi City and the national road going to the municipality of Sto. Domingo and Tabaco City. Located along the panoramic coast of Albay Gulf, the place also affords tourists a side trip to a world-class destination, the Embarcadero de Legazpi, a unique seafront commercial complex and recreation hub in this city conceptualized based on the Fisherman’s Wharf in San Francisco, California. This multibillion-peso project was built by Bicolano business tycoon Elizaldy “Zaldy” S. Co, executive officer of the Sunwest Group of Companies. While the Mayon Volcano attracts numerous tourists in times of her good mood, she is glamorous when she’s restive owing to awesome sight of fireworks and lava trickles rolling downslope. Though dangerous when the volcano is in her temperamental behavior, this makes Legazpi City even more a favorite destination of both local and foreign tourists eager to see her natural fireworks display. Legazpi City Mayor Noel Rosal said there is nothing to worry about the present condition of the Mayon Volcano as the city is safe from danger. “We are happy to announce that we have nothing to worry about the present condition of Mayon Volcano misleading reports from some camps using some media outlets,” Rosal said. In fact, until today, Legazpi City has not ordered any preemptive evacuation of residents because all families in the six-kilometer-radius permanent danger zone have been relocated to safe grounds since eight years ago, he claims.